As the end of his term as President draws near, Gjorge Ivanov is facing increasing threats from the ruling coalition camp, specifically calling him not to give pardons to the dozens of political prisoners arrested by the Zaev regime. Ivanov is particularly being urged to give pardons to the 16 prisoners arrested over the April 2017 incident in the Parliament, but also to many other former officials and VMRO activists who have been arrested on politically driven charges. He has until May 12th to give pardons. 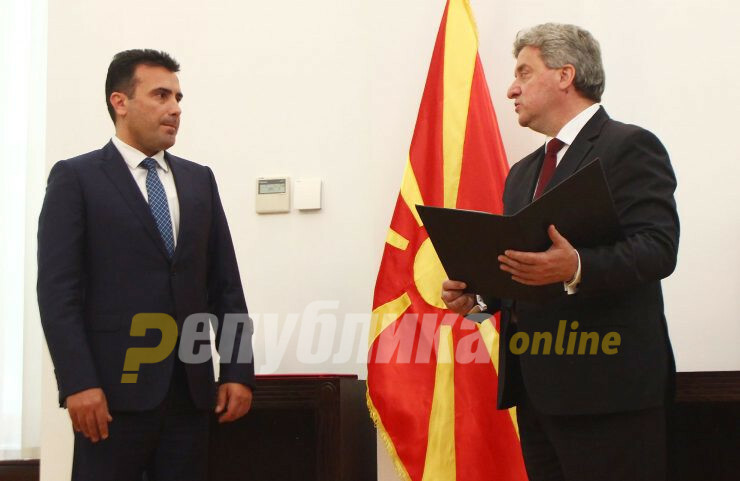 Why is Zaev pardoning Ivanov?, blared the latest headline of the pro-Government Fokus newspaper, urging Zaev to include Ivanov in the list of VMRO officials to face trumped up criminal charges. A similar threat came from Ali Ahmeti, who himself received pardons for the war crimes committed by his NLA/UCK terrorist organization. This would be a very poorly thought out move, if the outgoing President gives pardons. I’m not sure if he has the legitimacy to make that step, and it would prompt a response, Ahmeti said, openly threatening Ivanov. According to former Ambassador Arsim Zekolli, the double standards between the partial amnesty law approved by Zaev and Ivanov’s possible full amnesty, are staggering. When Ivanov declared amnesty (in 2016) it was a scandal. When Zaev gives a de-facto amnesty, that is called reconciliation, European values, turning a new page. Endless hypocrisy. SDSM are not opposed to Ivanov giving amnesty, they want to remain their exclusive right to give amnesties in exchange for political favors, Zekolli writes. Ivanov attempted to put an end to the wholesale blackmail of the Macedonian political scene in 2016, when he gave full amnesty to all targets of politically driven charges, both on the left and the right. But, this move was overruled as the political parties faced pressure to ask that the amnesties are withdrawn. In the meantime, the deluge of charges against VMRO officials were intensified, while well supported cases against SDSM and DUI officials were thrown out by the courts or even by the prosecutors. Finally, Zaev ordered a partial amnesty of members of Parliament who were charged with terrorism in the April 2017 trial, and whose votes he needed in order to rename the country. Sold under the guise of “reconciliation”, the partial amnesty was followed by a renewed series of politically motivated arrests and lengthy prison sentences even for people charged in the same case, who were not members of Parliament and therefore were not useful to Zaev, except as scapegoats.